Sometimes there are factors farther away from the proton that affect Bronsted acidity. In addition to considering the atom to which the proton is directly attached, we may need to consider other parts of the molecule to understand anion stability. A first factor to consider is delocalization due to conjugation. In Lewis structure terms, that means resonance. Delocalization of charge is stabilizing, so if a negative charge can be distributed across multiple atoms via resonance, a conjugate base will be more stable. resonance can delocalize negative charge and stabilize an anion. a more stable conjugate base forms more easily. A Bronsted acid will give up a proton more easily if it gives rise to a stable conjugate base. Many organic compounds contain hydroxyl or OH groups, some of which are acidic and some of which are not. Three kinds of compounds containing this group are alcohols, phenols and carboxylic acids. Examples of these functional groups include cyclohexanol, phenol and benzoic acid. Figure AB12.1. Cyclohexanol, phenol and benzoic acid. Cyclohexanol is an alcohol. An alcohol contains an OH group connected to a tetrahedral carbon. Phenol is slightly different; it contains an OH group connected to a trigonal planar carbon that is part of an aromatic ring. Aromatic rings are cyclic groups of atoms, usually carbons, with delocalized pi bonding all around the ring. Benzene is the most common example of an aromatic ring. It is a ring of six carbons and all of the carbons are trigonal planar. In the Lewis structure, it is drawn with alternating single and double bonds between the carbons. Benzoic acid contains a very different functional group in which the OH is connected to a carbonyl. A carbonyl is a carbon-oxygen unit with a double bond, C=O. The carbon in a carbonyl is trigonal planar, as in a phenol, but the presence of the double bond to oxygen makes a big difference. Cyclohexanol has a pKa of about 18. It is less acidic than water. It can give up a proton, but the proton is much more likely to be bound to the oxygen than disscociated. Phenol has a pKa of about 9 and is considered mildly acidic. Benzoic acid has a pKa of about 5; its acidity is similar to hydrofluoric acid, although not nearly as acidic as other hydrogen halides. Figure AB12.2. The anion resulting from deprotonation of phenol. Figure AB12.3. The anion resulting from deprotonation of benzoic acid. Comparing the conjugate bases of cyclohexanol, phenol and benzoic acid reveals some differences. In cyclohexanol, the anion formed by loss of a proton is localized on the oxygen. There is no resonance stabilization. In phenol, the anion formed by loss of a proton is delocalized. Resonance structures show the negative charge can be shared between the oxygen atom and three of the carbons in the benzene ring. In benzoic acid, the anion is also delocalized. This time the negative charge is shared between two different oxygen atoms. Resonance delocalization plays a clear role in stabilizing the conjugate base formed after loss of a proton. Despite the similar bond polarity in cyclohexanol and phenol, the proton is much more tightly bound in cyclohexanol. The greater stability of the phenolate anion compared to the cyclohexanoxide anion makes it easier to remove a proton from phenol than cyclohexanol. The atoms onto which the charge is delocalized still plays a major role in determining stability. Delocalization onto an additional oxygen atom may be more stabilizing than delocalization onto several carbons. Some compounds have acidic C-H bonds, despite the fact that many hydrocarbons have extremely high pKa's (such as methane, CH4, pKa = 50). Explain the reason for the trend in pKa's among the following compounds. Compare the acidity of the following pairs of compounds. a) ethanol, CH3CH2OH, and vinyl alcohol, CH2=CHOH. b) trimethylamine, (CH3)3N, and nitromethane, CH3-NO2. There is another way that distant atoms can influence anion stability. It has to do with electronegativity. Consider the pKa of these three, similar, halogenated carboxylic acids: bromoacetic acid, chloroacetic acid and fluoroacetic acid. The pKa of fluoroacetic acid is lower than that of chloroacetic acid, which is lower than that of bromoacetic acid. Fluoroacetic acid is more acidic than chloroacetic acid, which is more acidic than bromoacetic acid. Figure AB12.4. Acidity in some haloacetic acids. When the proton is directly attached to these three halogens, the pKa runs in the opposite direction. HBr is more acidic than HCl, which is more acidic than HF. That was because of the greater polarizability of the bromide versus the chloride and fluoride. In these haloacetic acids, the halogen can stabilize the conjugate anion via inductive delocalization. In an inductive effect, electronegative atoms can draw electron density toward themselves. That means the halogen shares the partial negative charge of the oxygen atoms in the carboxylate anion. electronegative atoms can draw negative charge toward themselves through bonds. this phenomenon is called an inductive effect. inductive effects spread out negative charge and stabilize anions. The effect is additive. If more than one halogen is nearbly, there is more electron-withdrawing effect. There is more positive charge on the proton, and when the proton is released, the resulting anion has more charge delocalization. Figure AB50. Additive inductive effects. 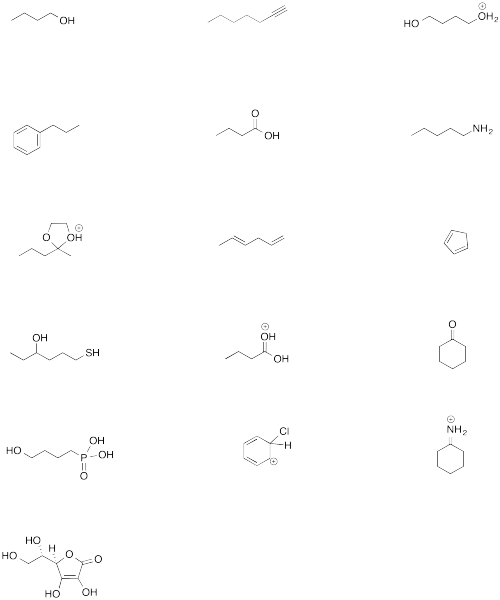 Predict the order of acidity in the following compounds. An important limitation on inductive effects is seen in comparing a series of chlorobutanoic acid derivatives. In 2-chlorobutanoic acid, the presence of a chlorine next to the carbonyl, four bonds from the acidic proton, renders this compound much more acidic than butanoic acid; the pKa's are about 2.9 and 4.8, respectively. Figure AB12.5. The effect of distance on inductive electron withdrawal. In 3-chlorobutanoic acid, the pKa is 4.0, whereas in 4-chlorobutanoic acid, with the fluorine all the way at the end of the chain, six bonds away from the acidic position, the pKa is 4.5. The fluorine in these last two cases has relatively little effect. Inductive effects fall off quickly with increasing distance from the acidic site. However, in aromatic systems the effect of distance is slightly weaker. In 2-chlorobenzoic acid, the effect of the chlorine is substantial, despite its distance from the acidic proton. The pKa of 2-chlorobenzoic acid is 2.94, as compared to 4.2 for benzoic acid, despite the fact that the chlorine is 5 bonds away from the acidic proton. This increased influence of inductive effects is common in aromatic systems such as benzene. Inductive effects are readily transmitted across conjugated systems like benzene. Figure AB12.6. The effect of distance on inductive electron withdrawal in an aromatic system. Aromatic systems contain delocalized, polarizable sets of electrons. In contrast to sigma bonds, in which electrons are delocalized between two atoms yet still located pretty reliably in between those two atoms, pi bonds hold electron density further from the nuclei, and are more easily distorted or polarized. a. Determine the most acidic proton and provide a reason for your choice. b. Draw the conjugate base.